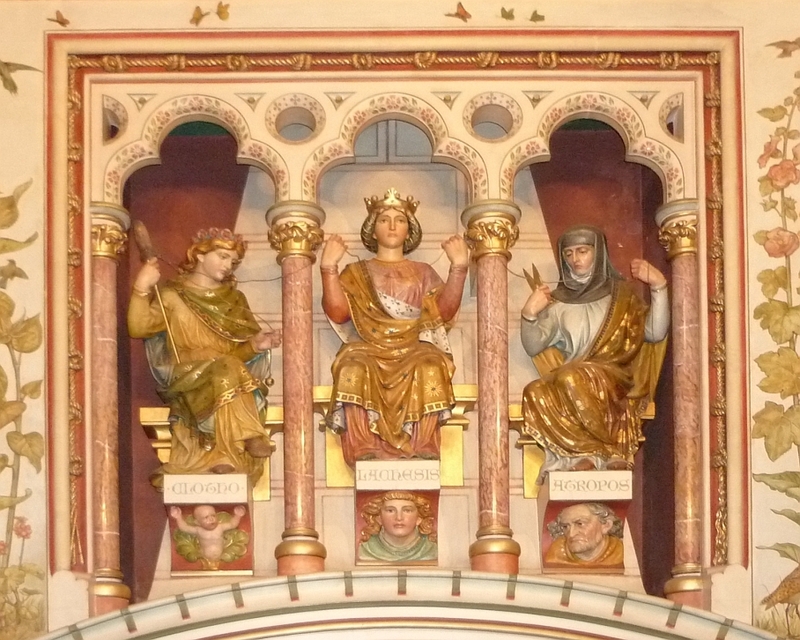 The Three Fates on the chimneypiece of the Drawing Room, Castell Coch, Tongwylais, Cardiff , carved by Thomas Nicholls to instructions by the architect William Burges. 1870s. In this truly "fabulous two-storey chimneypiece" (McLees 41), the Three Fates, Clotho, Lachesis and Atropos, are sitting with their feet resting on corbels showing infancy, youth and age. Clotho spins the thread of life, Lachesis draws it out to a certain length, and Atropos's scissors are on the point of cutting it. This may seem sombre, but the whole theme of this room is "Life and Death in Nature" (Crook 282), and the floral design on the tracery, together with the more pastel shades here and throughout, provide a sense of poignancy rather than tragedy. Indeed, the colour scheme and some of the other decorative touches, such as the "softer" murals completed in the later 1880s after Burges's death, do suggest a dilution of High Gothic (see McLees 43). Crook, J. Mordaunt.William Burges and the High Victorian Dream. London: Murray, 1981.